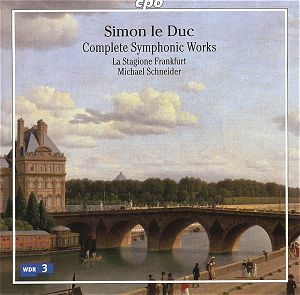 This is one of those CDs which got the better of my curiosity – not having heard of Simon Le Duc and having the opportunity of clearing up on his complete symphonic works in one go will be something which appeals to more than just me, so, who was Simon Le Duc? Simon Le Duc ‘l’aîné’ - the elder - was principally a violinist, so known to distinguish him from the younger Le Duc, his brother Pierre, who was also a virtuoso violinist and music publisher. A contemporary of Mozart, he also died young, but achieved the directorship of the ‘Concerts spirituels’ in Paris in 1773, having previously performed as orchestral member and soloist. Leopold Mozart wrote ‘he plays well’ in his journeys through Paris in 1763-64, and praise from that stern figure was hard enough to come by. The Concerts spirituals was one of a number of influential orchestral societies, which provided a platform for new symphonic developments at home in France and from abroad, such as the Mannheim school. During the 1760s the Symphony as we know it today was still in a state of development, and Le Duc’s style seems to have absorbed Austrian and Bohemian styles into the current French fashions, amounting to quite an advanced form of the tonal idiom of Viennese classicism represented by composers like J. Haydn, J.C Bach, W.A. Mozart and the like. The Orchestral Trio was a genre derived from examples by Johann Stamitz, and differs little from the chamber music trios with two violins and cello which were popular at the time, but which was soon overtaken by other forms such as the string quartet. Considerable research was necessary to bring as much of the existing music together from different sources with these works, but the results show trios of superlative technique and maturity. Take the Cantabile posato con espressione from Op. 2,2 with its deliciously expressive harmonies and melodic lines and you will hear what I mean. The three Symphonies appeared separately in various anthologies printed by Pierre Le Duc’s publishing company. They each have the same instrumentation of two flutes, two horns and strings. The lack of oboes makes for a nicely rounded orchestral sound, which is supplemented by La Stagione Frankfurt with unobtrusive continuo parts on fortepiano, and a doubling of the bass line with bassoon in the tutti passages. ‘Sturm und Drang’ is a strong element in these pieces, with expressive slow movements and plenty of energetic and witty playing for the outer sections – including an opening wake-up call which may blow your socks off. Listening to this CD, my initial ‘oh no not more early classical symphonies’ – a hangover from year one of a B.Mus. course at the R.A.M. – soon became ‘hey, this is really interesting stuff.’ The subtly inflected playing of La Stagione Frankfurt draws you in, and soon reveals the inventive qualities of Simon Le Duc’s compositions, and the freshness of both the works and the playing easily convince the listener of how wonderful the works must have appeared to audiences at the time.